The law requiring a 0.8mm minimum nacre depth requirement over 80% of the pearl surface for all Tahitian pearls is being scrapped from next January. The French Polynesia government and pearl producers have collaborated to bring in a new oversight regime for pearls which will bring in quotas for farms and lagoons to protect the environment and prevent over-intensive farming but which will allow all pearls to be sold commercially and exported – at the moment thin nacre pearls are destroyed. While some in the pearl business have already thrown up their hands and gone ‘waily-wail it’s all doomed’ I do feel that French Polynesia is to be congratulated for at least tackling their problem with a bold step, rather than shoving their heads more firmly into the ground, which is often the default setting of governments -and industry. What they are doing at the moment is not working post-recession. Producers will still be able to apply to the government inspection service for their pearls to be x-rayed and certified and it is likely that this will continue for high grade pearls . Nacre depth is an indicator of good farming practice since there has been time and effort expended by the farmer. The effect of this, at least in the short term is that, if you want decent pearls, more than ever you will need to trust your supplier, be it retailer, wholesaler or even farmer. Everywhere in the chain of supply there will be a divide into cheap old rubbish with a nacre depth of …well, a smear and high quality – good colour and lustre and thick nacre. You buy wholesale and the lot will be all mixed up from several sources – who is to say which pearl has which certificate. Or select a single one – does the wholesaler photocopy the certificate for a single farm lot – if he indeed has one.. So x-ray and certify was great in theory but in practice…it was great in theory. They are probably looking also at the Akoya market. You can have rubbish Akoya, even unto blinking, or you can have amazingly amazing pearls which require sunglasses they are so shiny. 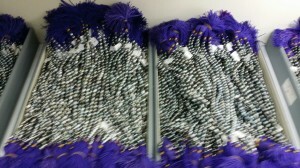 And you can also get a certificate for your high quality pearls. Or not. And of course there is no way to tell, even if you have a certificate, that it actually applies to that pearl. There is some work being done on implanting a readable micro chip into each and every nucleus to enable real identification, But that will push up prices and who has a reader? One excellent thing though is that, with the minimum nacre thickness over the nucleus rule going souffle Tahitians, grown in a way something similar to freshwater souffles and just as bg and with just such amazing lustre, will now become legally commercially available. 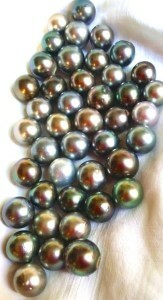 Expect 20mm irregular shaped baroque Tahitians next year. Pearl exports have plummeted:The latest figures from the Institute of French Polynesia statistics indicate that in April, exports of raw pearls fell sharply (65% in value). In reality once the pearls had entered the supply chain either legally after inspection or smuggling there was little beyond trust and expertise to guide a buyer. I’ve only once had a certificate for pearls and that was when I bought direct from Kamoka . And the system was obviously flawed as I could have photocopied the certificate and handed it out with any old pearls. Pearlescence will still go for quality product. It will be interesting to see what happens next year. 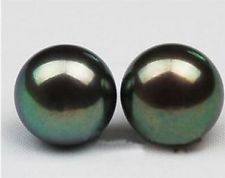 I suspect that a lot of rubbish will be marketed as ‘wow we have tahitian pearls at the price of freshwater’ when the reality is that the customer will be buying something with a smear of nacre. I can’t claim ‘no veneer in here’ because all bead nucleated pearls are veneered in reality, but Pearlescence tahitians will still be the best quality we can find for the price you want to pay. Chinese freshwaters are getting very close to a really good imitation of white south sea with that elusive satin lustre and also to gold. Golds are good when you look at one or two on their own but they have an ear-wax brown look en masse still (like the dyed SS themselves). I’ve seen lots of smaller dyed fresh which look close to peacock tahitian but no real attempts to make them imitate tahitian strands so far. This entry was posted in World of Pearls and tagged french polynesia, nacre, nacre depth tahitian, pearls, tahiti, tahitian pearls on June 8, 2016 by WendyG.